Are these not the cutest little appetizers ever, or what?! I had planned to share these with you yesterday, just in time for Mother's Day, but then the day flew by and I totally missed it. I'm sorry! 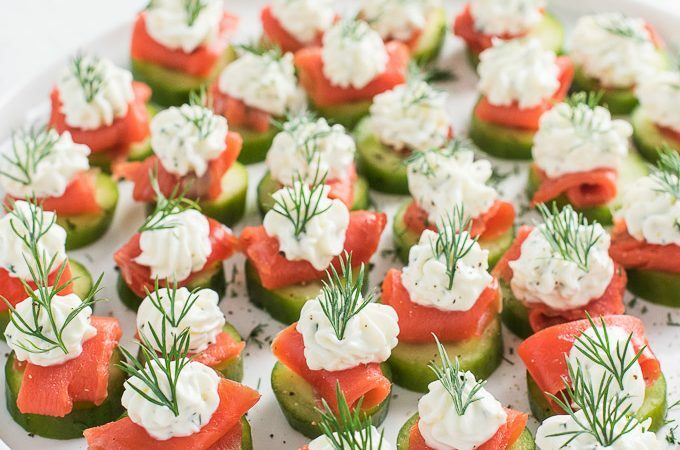 You don't have to wait until next year just to make these adorable smoked salmon appetizer bites. With summer just around the corner, these guys are what you want to bring along to all of your outdoor parties. There's no need to look any further for smoked salmon appetizer recipes. This one is it. Seriously, your friends will love you for it. They're so pretty! And let's be honest, pretty food is more fun to eat. You can look like a rockstar at your next part. Just don't tell anyone how easy it is to make these little bites. They're gluten-free, which can be rare for party appetizers. 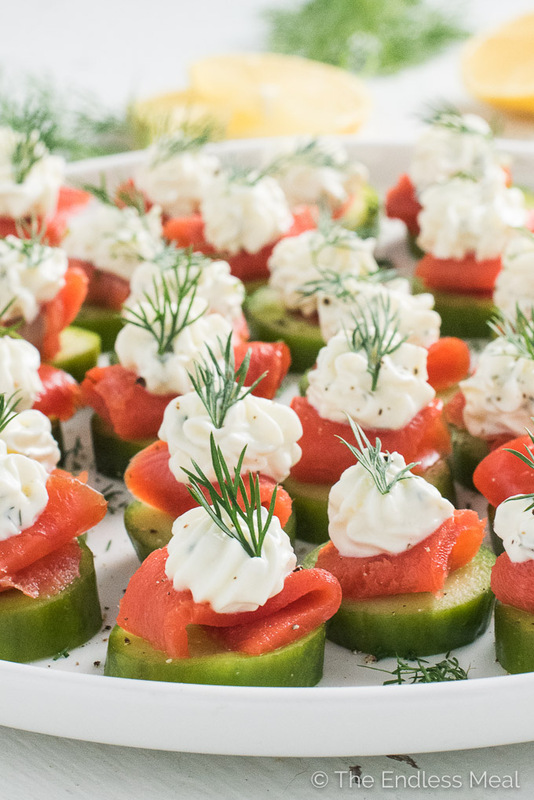 There's just something about smoked salmon cream cheese appetizers that are impossible to resist. It's seriously the best combo. I have yet to meet anyone who doesn't love these little guys. There are few things better than smoky salmon, crunchy cucumbers, and lemony cream cheese. It's classic, my friends. All I've done here is pretty them up a bit so they are party perfect. But don't worry, these pretty little bites are a breeze to make. Looks are totally deceiving! I've used mini cucumbers so they are truly bite-sized and then rolled up tiny slivers of lox-style smoked salmon. The lemony dill cream cheese is pipped on, which is WAY easier than dolloping it on my the spoonful. And prettier. Obvs. Add all the lemon dill cream cheese ingredients to a medium-sized bowl. Use electric beaters to whip together. Transfer the cream cheese to a piping bag fitted with a star attachment, or use a small resealable plastic bag and cut off the tip. Lay the cucumber slices out on a serving tray. 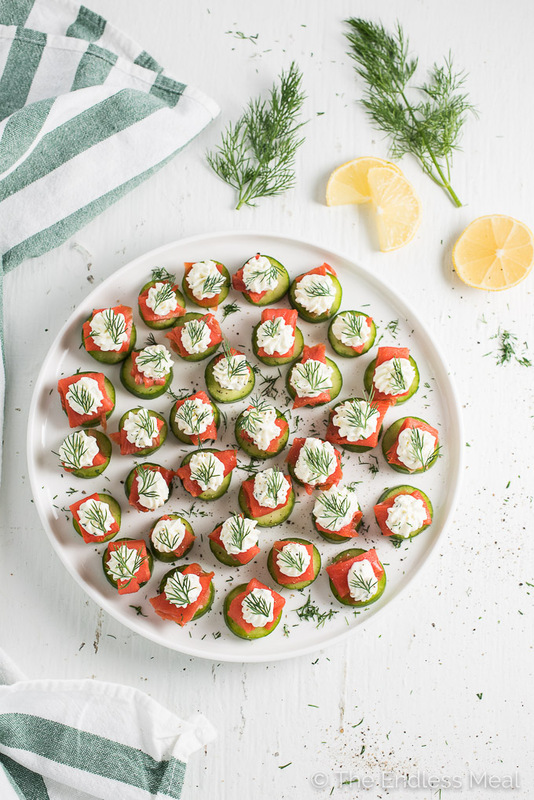 Roll small strips of the smoked salmon and place them on top of the cucumber slices. Pipe the cream cheese on top of the salmon and garnish with a little fresh dill and fresh cracked pepper. 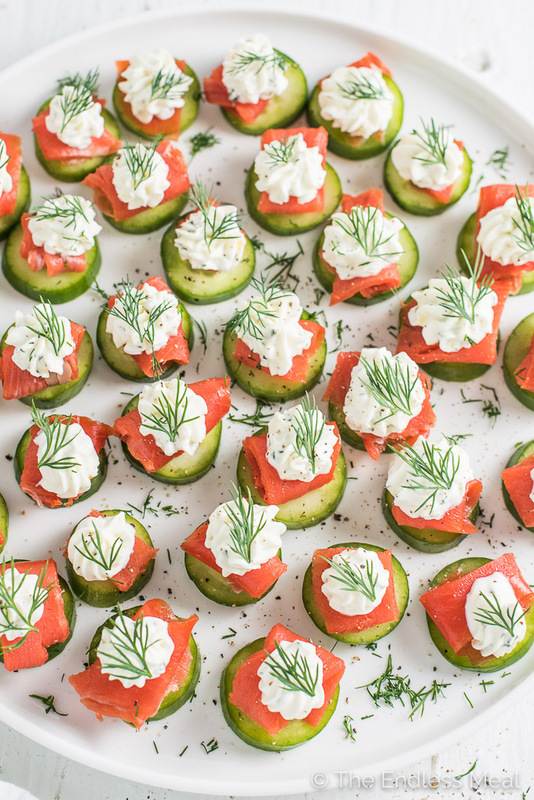 The lemon dill cream cheese can be made up to two days in advance and kept in your fridge until you are ready to assemble the cucumber smoked salmon appetizer bites. This looks delish except my son is allergic to dill, do you have any suggestions about what other herbs to pair with this? Do ( have to cook the salmon to make a cheese spread? These little bites look delicious, and I think the lemon is a perfect touch. I have. Vanilla. Plain yogurt not Greek, should I just omit or is there another substitute? I would thicken the yoghurt you have and use as Greek. I do this by pitting the yoghurt in the basket of my coffee maker with a paper filterin it and letting it drip into a bowl until it is the thickness I want.. You can do the same with a conveeentinal strainer lined with a paper towel. Then use it as Greek youghurt. Would like to make these for an open house. How many hours can I make these ahead of time?